Sodynee Black Velvet Bracelet Necklace Jewelry Display Stands Display Rack Hold and display bracelets, necklaces, anklets and watches at home or in store, keep all jewelry at sight. Durable Black Velvet surface prevents scratches and damage, Removable for easy assembly. 3 tiers and sloping design offer multi-level for jewelry, and increase stability, save place, decorate your dresser top. Exquisite appearance and special craft are the main factor why customers love them. Approx Bracelet Holder Display Necklace Display Stand Dimensions: 13″ x 10″ , Approx Rod Diameter: 1.97″ (50mm). The display case is very easy to set up in about 30 seconds. Once set up, it will serve as a sturdy and safe place to store your precious jewelry. 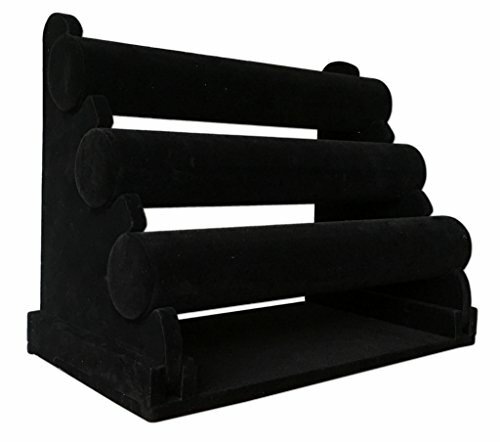 Jewelry Display Stands are crafted from beautiful black velvet that’s soft to the touch and will product your jewelry from any kind of damage or abrasion. This Bracelet Holder Display Stand will add a modest touch of elegance to any room its placed it. It’s also ideal for store front display cases. Necklace Display Rack Comes with 3-Tiers that provide a professional and elegant display, Approx Measures 13″ x 10″, Accessories not included.